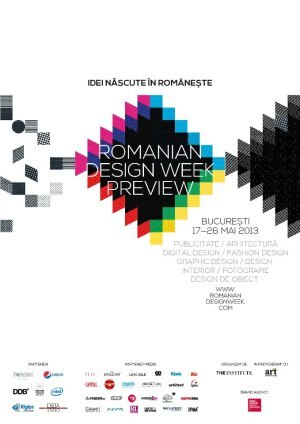 Romanian Design Week – Preview takes place in Bucharest, between 17th-26th of May 2013. Over 90 designers, more than 30 locations and over 35 partner events define the first large-scale event dedicated to Romanian design. The Ştirbei Palace will also host the Students’ Exhibition, the result of a partnership between RDW and the faculties with converging profiles from across the country. Same schedule as the main exhibition. Romanian Design Week – Preview also gathers more than 35 partner events, which will draw the map of Romanian design and will promote local creativity. Access is open to all the events. 17 – 26 May, Ştirbei Palace, basement. 17 – 26 May, Ştirbei Palace , 1st floor. Starting at 10am, on Sunday, the 19th of May, the Ştirbei Palace will host „Architecture Hunting”, organized with our partners „de-a arhitectura”. This event is aimed at children aged 5 to 15, who are encouraged to become acquainted with architecture, to learn new ideas and notions relating to design and to have a positive experience that they can associate with design. The 20th of May is Intel Day @ Romanian Design Week. The first part of the day is reserved for journalists and bloggers who are passionate about style, design and technology. They will be introduced to the newest convertible Ultrabooks inspired by Intel, in a unique presentation that associates them with personal style and interior design objects created by Ana Morodan and Anca Fetcu. During the afternoon, Facebook fans of Intel Romania will be invited to attend the central exhibition at Romanian Design Week and the Intel, Design your world now exhibition, which will be hosted at the first floor of the Ştirbei Palace and will be open for the public between the 17th and the 26th of May. Between 17 – 26 May, The Stirbei Palace will become the gathering point for all design professionals, enthusiasts and for the general public. You can join us at any time (between noon and 10pm) for drinks at the Peroni terrace, set in the garden, to write on the adidas inspiration wall or to see the Plai setup by Republic of Architects, to browse through the design books & magazines you can find in the lobby at the 1st floor (brought by Prior & Lurzer’s Archive), and, of course, to visit the main exhibition. All design conversations happen at Fratelli Espresso Bar every evening, after 10pm. On Tuesday, the 21th of May, Carol 53 will host the exhibition “Verde-n faţă”: a group of visual artists, landscape architects, object designers, photographers, musicians, interior architects and environmental activists will advance an interpretation of nature that combines several forms of artistic expression. Graffiti BBDO believes in efficiency and often embraced the “less is more” philosophy, which has often proved to be one of the best ways to deliver valuable executions, both creative and efficient. Romanian Design Week – Preview presents an exhibition where viewers can admire some of the best minimalist works Graffiti BBDO has created in/over time. During Romanian Design Week, Aiurart Gallery will also host an exhibition dedicated to Romanian product design – “Design for arts sake”. On My 25th Lowe&Partners organizes Tav’art Collective, when graphic artists, chosen by a jury will actually tattoo the Lowe ceiling during a 12 hours open doors marathon, with music, drinks, visitors, and Atelierul de Print exhibition. Lowe & Partners challenges the conventional. During Romanian Design Week – Lowe offers the ceiling of its creative department as canvas for visual artists willing to turn it into a piece of art.Young artists can subscribe in the competition by sending two relevant pieces of work reflecting their style before Friday, May 17th, 2013, to [email protected]. A jury made of Lowe creatives, Irlo & the Institute will pick the winners who will be offered all the necessary materials in order to paint the ceiling of the agency. All the winning artists will also be rewarded with 6 months subscriptions to Wallpaper & Institute, The Magazine. On Monday, the 20th of May, the Friends For Friends Foundation will host the opening event for the Romanian “Fluenţe” exhibition, organized by the Arhitext Foundation. The exhibition is a unique selection of Romanian projects that honor Romanian architecture and design, which outline the map of the most recent trends, movements and communication corridors in the “basin” of Romanian architecture and design. The exhibition is open until May 25, in a relaxing space, created as a reading lounge for the exhibition visitors. As part of Romanian Design Week, the results of Parametrica Generative Optimization – „How you can design something that you can’t imagine” will be presented in an exhibition that is open to the public from May 20th until May 26th. This is set to become an extensive session on how to optimize and transform an idea into a project, using digital generative instruments. Exhibition showing Teo Isfan’s works. On May 24th you can join “Noaptea alba a tatuajelor”, event created in collaboration with Industrial Tattoo – starting 7.30pm. 10 of the most famous Romanian designers will directly interact with the city through 10 shop windows created in their unique style. The Place Concept Store will create a special corner, reserved for the works of famous Romanian designers: Adelina Ivan, Andreea Bădală, Maria Marinescu, Le Petit Indigent, 109, Pas du Tout (Mădălina Dorobanţu) and Anais Sand. Portobello is a workshop store situated on a peaceful street near the Romanian Athenaeum, where visitors are invited to watch the making of their unique dresses and to buy some of the items on display. The event will gather a showcase of designer objectsin the gallery and the shop. The main element is the t-shirt that designer Andreea Badala (Murmur) especially created for Galateca. “Made for supergirls” party, Ludmila Corlăţeanu, Una ca Luna and ALLIAGE exhibition. Fashion Picnic #13 is bound to bring together, in a holiday spirit those passionate about fashion design and culinary habits. Free entrance. This year, Bēhance Portfolio Reviews event will be joining Romanian Design Week. Bēhance Portfolio Reviews is a trans-national event, organized in several cities throughout the world during the week of 13th-20th of May and it has the purpose of reuniting the members of the Bēhance community, in order to help them get to know each other and to offer and receive feedback on their portfolios. This year’s edition is organized by The Type Collective and its three moderators, Barna Nemethi, Radu Popescu and Andrei Robu, and will openly discuss their portfolios, while also offering advice to those interested in graphic and web design, photography, fashion, ambient, motion and illustration. Carturesti Verona hosts the Strainers‘Light instalation by Palier Design (authors Carmen Acsinte and Eduard Constantin) in the ROD Gallery. Dizainăr will host a series of presentations by some of the best-known object designers in Romania. Themes like “Originality in design”, “Assessing applicability, scale, utility” or “Developing the market through positive communication and mutual support” will be discussed on each open day. There is no fee for access at these presentations. Eclecticó Studio will open this spring in a superb Art Deco villa on Constantin Budişteanu Street; the showroom offers an eclectic mix of design objects both vintage and contemporary and will proudly present a special room, dedicated to Romanian design. And a lot of surprise events during Romanian Design Week. Intro has prepared a multimedia presentation in the form of a “Design Trend Book” with over sized pages. Whether we are on the topic of the latest prototypes launched by young designers, the newest objects launched by top international companies or the conceptual presentations of great design schools, this presentation becomes a summary of current ideas and concepts in product design. Atelier Anda Roman invites all art and interior design lovers to “Remember in order to forget”, a photo exhibition by the Israeli artist Miri Mor. The opening will take place on Monday, May 20, at 7pm, at Anda Roman Shop, on 42 Grigore Alexandrescu St. The music for the opening will be provided by young musicians, scholarship winners of the SoNoRo Festival. BMW is holding a press conference on Wednesday, the 22nd of May, starting 11am. The special guest, Daniel Mayerle – Creative Director, Interior Design BMW Worldwide will discuss the process of design and how the creative team at BMW works. On May 23rd, architecture offices open their doors for the curios and architecture aficionados, who are invited to visit them, to get to know the team and to better understand the domain. Participating offices: AA Studio, Square One, SYAA, RPR_, Republic of Architects, BBM Group, UnulaUnu, Tegmark, EasternWorks, Ideogram Studio, Stardust, Wolfhouse Productions and Laboratorul de Arhitectura (Parametrica). During Romanian Design Week, Cohn&Jansen will display a special billboard to promote Romanian design at the crossing of Arthur Verona and Dionisie Lupu streets. This event consists of an urban stroll on the Belle Epoques route, throughout which the topic of discussion will be the haussmannian influence for the boulevards of Bucharest, life at the beginning of the 20th century and the gradual disappearance of the old slum. The entrance to the Sf. Ştefan-Popa Soare area will introduce visitors to the development of the “wagon-house” and the structure of this type of building – as well as the way it was directly determined by the lifestyle of the time. Participants will also learn how the process of modernizing Bucharest began and will also be able to see the plans, sketches and images of the area during the so-called Belle Epoque. Submissions are open for participants on www.ideiurbane.ro. Between 17 – 26 May, Institute, The Cafe will become an info point for all the Romanian Design Week events. "Romanian Design Week " Festival in Bucharest. You can get here description, reviews, address, time and details of "Romanian Design Week " Festival in Bucharest. Visit Bucharest Tips for more Festival events in Bucharest!